Introduction to Cake Filtration presents a comprehensive account of cake filtration studies including analyses of cake formation and growth, results of filtration experiments and data interpretation, measurements and determinations of filtercake properties, and incorporation of cake filtration theories to the analysis of several solid fluid separation processes. It aims at providing the necessary information to prepare people planning to undertake cake filtration work beyond the elementary level. In particular, it is hoped that this book will be helpful to individuals who are interested in cake filtration research and development quickly on track. 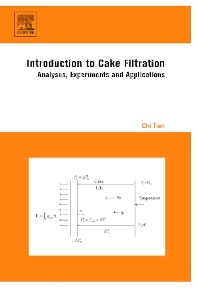 This volume on cake filtration consists of three main parts: analyses of cake formation and growth, filtration experiments and cake property measurements, and the incorporation of cake filtration theory to the analysis of fluid-particle separation process. It is intended to introduce engineers and engineering students to the subject opf cake filtration at an advanced level and to provide useful information to practicing engineers interested in the design and development of cake filtration systems.